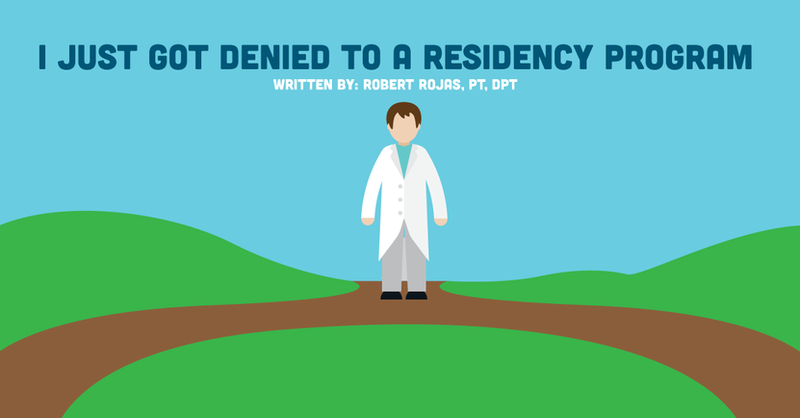 I Just Got Denied To A Residency Program: Now What? PT school is nearing its end and planning for the next step in your physical therapy career is taking the focus. One of the options after graduation is entering a residency program. A residency program can offer a new grad an opportunity to continue honing skills in a particular specialty. In my final year of physical therapy school, I planned to set myself up to be competitive. However, after a valiant attempt, I did not get accepted to the programs to which I’d applied. I was distraught, but I needed to figure out my plan B. I took the next few weeks to step back and assess my situation. During this time, I found three ways to make sure that my goals for my career stayed on track despite not getting into a residency program. Here are the three things that I would recommend for any new grad who does not get into a residency program. Getting denied from a residency program doesn’t mean your career goals are shattered. Your first step is to assess the big picture. The main question I asked myself is “What did I want to get out of the residency program?” Knowing this answer will help you figure out your next move. Writing down both your short and long-term goals for your PT career is a great way to visually see your plan. Try writing down a 3, 6, and 12-month list for short term goals. For your long-term goals, it may be helpful to do a 2,5, and possibly 10-year goals. Having this on paper can allow you to see where you want your career to go and plan your path to get there. Whether residency is still in the picture or not, you will feel more confident in moving through your new career. Mentorship is one of the major benefits of a residency program. However, you can find mentors in many other places. The first place to search is at your job. Many companies and clinics offer some type of mentorship program to new grads. One thing to be aware of is that not all mentorship programs are created equally. You want to make sure that it is what you are looking for in a mentor/mentorship program and in the specialty you desire. [callout] Another great option, and one that I found to be beneficial to my growth in my first year after graduating, is online/distant mentors. After finding out about the outcome of my residency applications, I searched for mentors in the areas I was interested in learning. I was fortunate to find some great “online” mentors and the programs they offer. Greg Todd, who has been an amazing mentor, is in the field of professional advancement. His program Smart Success PT has provided me with a great foundation of “levelling up” in the PT world. Clinical mentors such as Chris Johnson and Mike Reinold are other great resources in the running and sports physical therapy realms. Another great aspect about this type of mentorship is the Facebook groups that allow you to discuss with mentors and other physical therapists with similar interests. These resources provide the opportunity to learn from experienced clinicians and grow as a new grad. When you decide to apply for a residency program, it’s usually because you are interested in learning as much as possible in your specialty of interest. A residency program sets up the learning environment for their residents with courses, research, and practicals. Taking CEU courses independently can allow you to continue learning valuable information, concepts, and up-to-date research. One benefit of taking CEUs on your own is that you are able to choose exactly what you want to learn! Yes, some courses are expensive; however, just like the residency program, it is an investment in yourself. One tip when deciding on your CEU courses is to research instructors and feedback from clinicians who have taken the class before. This will ensure that you are receiving the best evidenced-based education from top clinicians in the field. Distance-based CEU courses can be an option as well. MedBridge is a great option that offers CEU courses from top PTs in many different specialties including Orthopedics, Sports, Neurology, Geriatrics, Pediatrics, and more. Although a residency program may have been your first choice, a denial doesn’t mean all hope for a successful career is lost. Developing a plan for your short and long-term goals will be your foundation to seeking alternative ways to get there. If a residency program is still in the picture for you, don’t give up. Improve your application, seek out learning opportunities, and network with other PTs to better your chances for the next attempt. Getting denied from a residency program is never a good feeling. Having first-hand experience, I was discouraged and filled with self-doubt. This is a natural reaction for anyone. Closing in on my 1-year post graduation, I can attest to the above advice. I had the opportunity to learn from many different mentors, both in person and online. This has allowed me to grow as a physical therapist and really find the population I am passionate about. Running and sports have always been my passion, playing soccer and running in 5ks, 10k, and half marathons regularly. When I did not get accepted into a sports residency program, I searched other ways to continue follow my passion. I searched out mentors and took both online and in-person courses in hopes to improve my knowledge on these topics. One of the challenges of learning outside of a residency program is maintaining self motivation. However, my motivation was my WHY and passion for education in order to help my patients best. All in all, this experience has taught me much more both personally and professionally. A residency program is a great avenue to advance a new grad physical therapist; however, it is not the only way.